Manervia W. Riddick became a member of the Maryland Stadium Authority effective July 1, 2009. Ms. Riddick is Senior Vice President for Business Development & Public Affairs at Strategic Solutions Center, Inc, a Washington area government and business support services consulting firm. She serves as SSC’s team leader on major energy services projects for national and international clients. Before her retirement, Ms. Riddick was the Director of Public Affairs for Washington Gas. Her occupational background and experience include regulatory, legislative, community, and consumer development. She was a Vice President and General Manager of Metrovision of Prince George’s County, the local cable television company which is now a franchise of Comcast, Inc.
Ms. Riddick held numerous positions with the U.S. Department of Justice, from Special Assistant to the Assistant Attorney General to National Director of Policy Planning and Coordination for the Office of Juvenile Justice Delinquency Prevention. 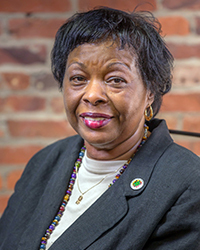 Ms. Riddick also has an extensive history of social and civic volunteer service, which includes the Board of Directors and Executive Committee of Nexus Health, Chair of the Maryland Center Board and Member of the Foundation Board for Norfolk State University. Her past affiliations also include board leadership with the Maryland and Prince George’s County Chambers of Commerce. Ms. Riddick is a graduate of Norfolk State University and further graduate study in urban planning and public administration at Old Dominion University, in Norfolk, VA.